Andrea Faye Christians gets a tour of the historic Balluta Buildings. Malta’s chequered history has left us an inheritance of architectural richness and noble buildings. But perhaps none has the iconic presence that Balluta Buildings in St Julian’s enjoy. The name of the buildings is derived from the Maltese word for oak trees, of which several grew in the square immediately in front of the building. The trees also gave their name to the bay opposite Balluta Buildings. In 1920 the Old College, at the time one of the principal schools in the area, moved to a larger location and Balluta Buildings were built in the area formerly occupied by the school gardens. Finished in 1928, Balluta Buildings still stand as an enduring testimony to the Art Deco style of building that originated in France and became hugely popular across Europe and the US until its decline before World War II. Art Deco came to symbolise the Roaring Twenties and was a reaction to the bleakness of the Great Depression between the 1920 and 1940s. 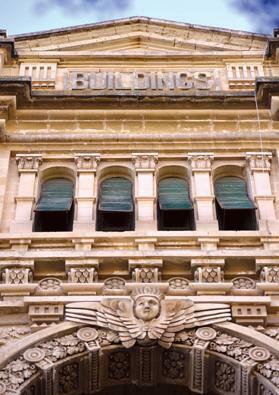 Today it is an architectural legacy and its rarity, especially in Malta, has made Balluta Buildings a valuable icon. When Balluta Buildings were finished, the apartments were not only some of the most luxurious but also the largest in Europe. No surprise then that it was considered to be one of the most prestigious addresses on the island. However, in time, the building fell victim to the now defunct rental laws – this meant that tenants could remain for generations for a nominal rent and could also pass it on to their heirs. Only a fairly recent change in the law has made it possible for the owners to take possession of the apartments once again. Still, this is a slow and painstaking process and, to date, of the 20 apartments, only three have come back into the owners’ possession, while another one had been ­previously sold and remains ­privately owned. Matthew Marshall, who is the great, great grandson of the original owner, took me on a tour of these newly reacquired apartments. The first thing that strikes you is their sheer size. Columns, high ceilings and expanses of traditional Maltese tiled floors characterise each apartment. Sadly however, the years have taken their toll and all around there is a feeling of decay. However, it doesn’t take a vivid imagination to visualise how impressive they must have been – and could still be – when they were built. Marshall is on a mission to bring life back into the old building. However, in some ways the fact that the building is privately owned is a double-edged sword as significant investment is required. 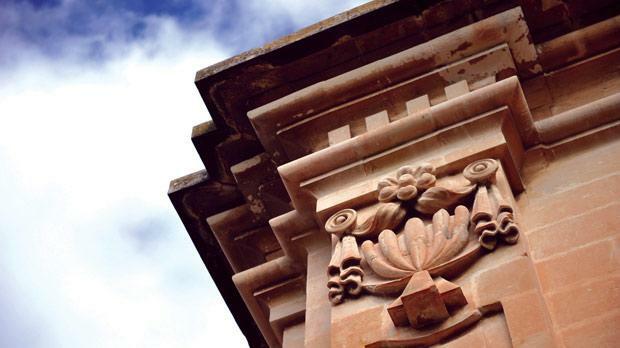 The restoration would need to develop as a business venture if Balluta Buildings are ever to be restored to their former glory. Already at street level there are a number of food outlets that include a health food shop and a French style patisserie. “I would like this to develop into a street where people can sample different cuisines from various part of the world,” he says. His endeavour can also be found nearby. As the owner of several successful restaurants he already has an impressive track record as a businessman. The transformation of the onetime storeroom has been an ambitious undertaking that has taken eight years to realise. The resulting Electro Lobster Pro-ject is inspiring in its originality. It is a subtle combination of old and new that retains the essence of the soul of the building, with Art Deco nuances everywhere from the staircase to the 400 or so old style bulbs that light the bar area below. Above all else, it is a great example of what can be can be achieved with flair and imagination. Marshall drew on his experience as a sound engineer to create the perfect atmosphere for diners. The dining area is soundproofed with thick glass overlooking the bar below. Live bands can also be watched on monitors with the volume of the music diffused so that diners don’t have to be drowned out by the music being played below. In the meantime, the struggle to regenerate the rest of Balluta Buildings continues. Despite being a historic landmark, the onus of its upkeep remains on the owners. This is no easy task. The facade itself is characterised by an eclectic mix of terraces, symmetrical geometric shapes and lavish ornamentation. After almost a century of facing the elements it has suffered the ravages of time and pollution as well as the constant battle with pigeons in the area. Restoring it would be a mammoth task. To date, the future of the apartments as yet remains undecided – however, their business potential in one of Malta’s most sought after locations is undisputed. Maybe one day we’ll see Balluta Buildings re-emerge as a boutique hotel or as residential apartments. Only time will tell but it certainly seems a fitting revival for one of the most iconic buildings on the island.